A single sentence, uttered in the trial of George Zimmerman for the shooting of teenager Trayvon Martin, has catapulted an issue into the national spotlight. When asked if she could read a letter in court, witness Rachel Jeantel, her head bowed, murmured with embarrassment, "I don't read cursive," according to court testimony. "Cursive should be allowed to die. In fact, it's already dying, despite having been taught for decades," Morgan Polikoff, assistant professor of education at the University of Southern California's Rossier School of Education, told The New York Times. "Very small proportions of adults use cursive for their day-to-day writing," Polikoff said. "Much of our communication is done on a keyboard, and the rest is done with print." The recently established Common Core State Standards, the standardized educational benchmarks for U.S. public schools, omit cursive as a requirement. Some states, including Indiana and Hawaii, had dropped cursive from their curricula in favor of keyboard proficiency as early as 2011. "I think it's important to have nice handwriting, but the importance of having to learn two kinds of handwriting seems unnecessary given the vast method of communication is on a keyboard," Polikoff told the Los Angeles Times. Nonetheless, cursive has its aficionados, who note that many historical documents will be illegible if people can't read or write in cursive. "Cursive writing is a long-held cultural tradition in this country and should continue to be taught; not just for the sake of tradition, but also to preserve the history of our nation," Jimmy Bryant, director of archives and special collections at the University of Central Arkansas, told The New York Times. Others claim cursive is important because it's faster and more efficient than printed writing. "It's not calligraphy. It's functional," Suzanne Asherson of Handwriting Without Tears, a handwriting program for teachers, told the Los Angeles Times. 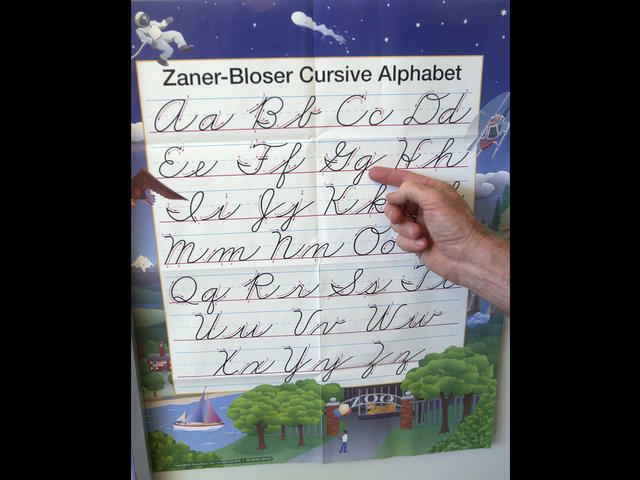 "When a child knows the mechanics of forming letters in cursive, they can better focus on their content." Handwriting Without Tears advocates a simpler method of cursive writing, minus all the curls, loops and other decorative flourishes.